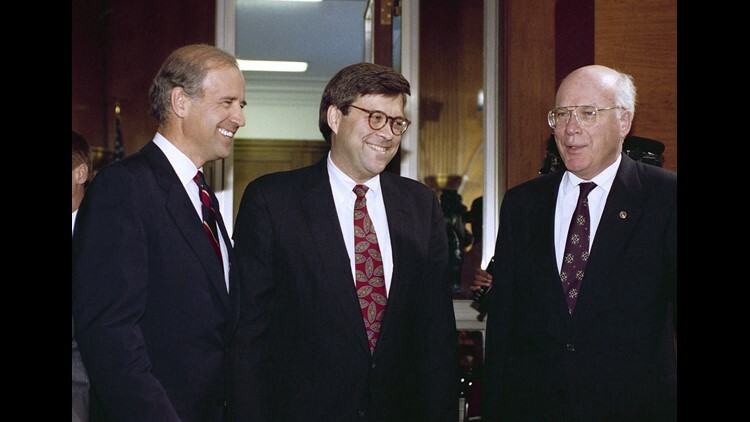 Former Attorney General William Barr is flanked by then-Sen. Joseph Biden, D-Del., and Sen. Patrick Leahy, D-Vt., prior to Barrís nomination hearing on Capitol Hill in Washington, Nov. 12, 1991. In July 2017, Barr told the Post that he thought Mueller should have greater ideological balance on his team. Additionally, in a May 2017 op-ed he said that Trump made the right decision when he fired FBI Director James Comey, who had been charged with leading the Russia probe.